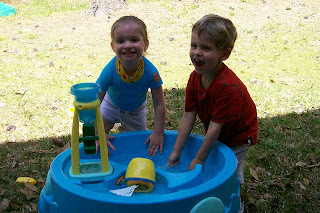 Kaelin and Dawson enjoyed the nice, warm weather with a little water fun. 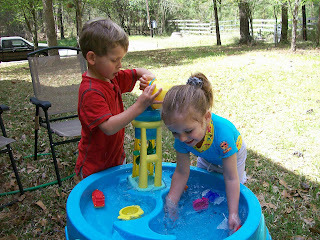 They played with the water table and splashed in the pool. They were a joy to watch - they had so much fun together and their sweet laughs and giggles made Angie and I laugh too. What fun kids!!! Calmly playing with the cups and boats in the water table. Not so calmly playing anymore. They were throwing toys out, splashing water everywhere, and slinging water on us.